Huge numbers of observations combined with computational modelling are finally giving astronomers a realistic idea of the three-dimensional shape of galaxies. There are billions of galaxies in our universe – more than 10 times the previous estimate of 200 billion – but we know surprisingly little about what they really look like in three dimensions. Unlike Solar System objects, which are within physical reach of humanity’s technology such as the Cassini and Voyager probes, galaxies are so distant that they are only ever viewed in projection onto the celestial sphere. While we may have images of many of the galaxies, these images are two-dimensional, and deducing the galaxies’ true shape is a bit like trying to work out the shape of an object that creates a shadow puppet. As different shapes can project identically on a two-dimensional surface, measuring the three-dimensional shape of galaxies is a challenging problem that has daunted scientists for almost a century. But our research, published today in the Monthly Notices of the Royal Astronomical Society, sheds new light on how to determine the 3D shape of a galaxy. Galaxies may be flat like a pancake, squashed like a sea urchin, elongated like a rugby ball, or anything in between. It’s theorised that the 3D shape of a galaxy may give some idea on how it formed and evolved. 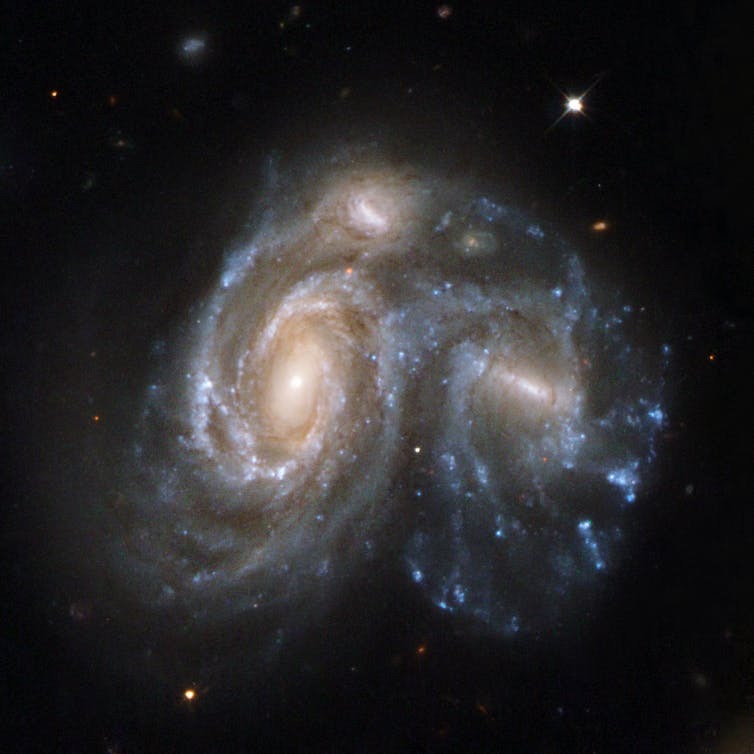 For example, models suggest that galaxy-on-galaxy encounters lead to more spherical systems as the stars get puffed up through these cosmic collisions. When gas falls into a galaxy to form new stars, it usually settles onto a disc, leading to a flatter structure. So accessing the shape information of a galaxy can provide a new angle for studying its formation. 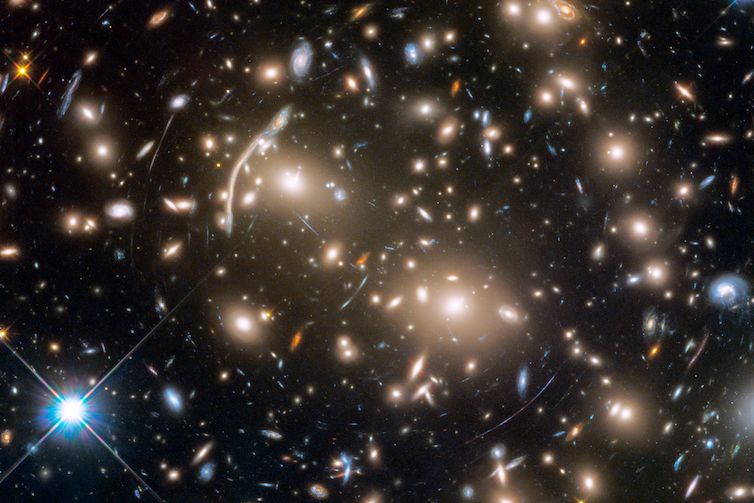 The first galaxies were probably formed by gravity pulling vast clouds of matter together. For the same reason that figure skaters spin faster when their arms are closer to their body than when they are extended, the collapse of matter leads to an increase in spin of the galaxy. The possible subsequent aggregation of surrounding matter also speeds up the spin of galaxies. On the other hand, galaxy interactions mix the stellar orbits, causing galaxies to lose their preferred sense of rotation. 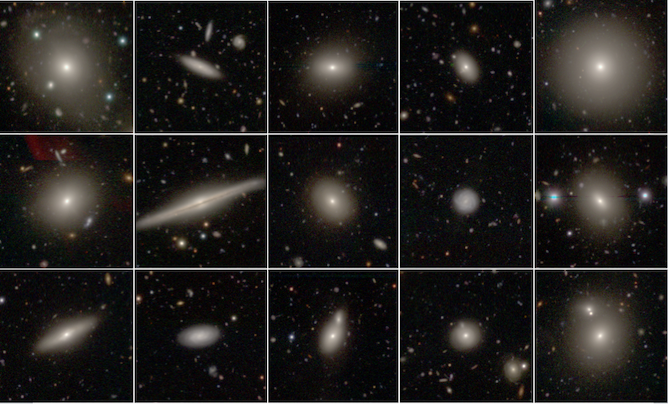 Most previous studies have used images to estimate the 3D shape of galaxies, but images provide little leverage on the third dimension, yielding multiple possible solutions. But with the Sydney-Australian-Astronomical-Observatory Multi-object Integral (SAMI) field unit instrument on the 4-metre Anglo-Australian Telescope, astronomers can obtain detailed information about the movement of gas and stars inside galaxies. Analysing the movement of stars around galaxies together with their image on the sky is key to unlocking the third dimension. Measuring the motion of stars around galaxies is not exactly the same as measuring their position in 3D. In order to infer the 3D shape of galaxies from their stellar motions, large samples are required. The novel SAMI instrument can observe 13 galaxies at a time, enabling the collection of data on thousands of galaxies in a relatively short period. With more than three times more data than the largest previous study, astronomers are now beginning to understand the processes that shape galaxies. Our new study is the first to confirm that increased rotation alters the shape of galaxies in a predictable way. 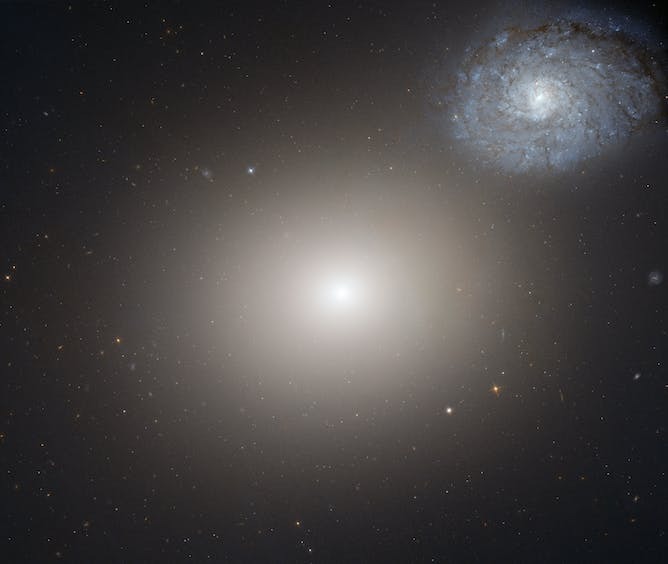 The faster a galaxy spins, the flatter it becomes, with the fastest rotating galaxies being nearly perfect discs. This video shows various projections of the inferred 3D shape of the fast spinning galaxies in our study. This animation highlights that galaxies can look very different depending on how they project on the sky. Conversely, galaxies that do not rotate, or rotate very little, have more varied shapes ranging from oblate spheroids (like sea urchins, or squashed beach balls) to triaxial ellipsoids (more like potatoes, or squashed rugby balls), consistent with having experienced a history of significant interaction. Similar to the previous animation, but this time showing various projections of the likely 3D shape of low spin galaxies in our study. The 3D shape of galaxies reveals that low-spin galaxies have undergone a complex history of interaction, while high-spin galaxies probably lead a quieter lifestyle and/or have engulfed significant amounts of gas from their surroundings. Detailed computer simulations of galaxy formation suggest that galaxy shapes can also be influenced by the so-called halo of invisible dark matter that surrounds them. In future studies, by comparing this newly observed shape information with other observed galaxy properties (such as their location in the universe, how much gas they have, and the ages and chemistry of their stars), astronomers will now have a new tool for testing these theoretical predictions. 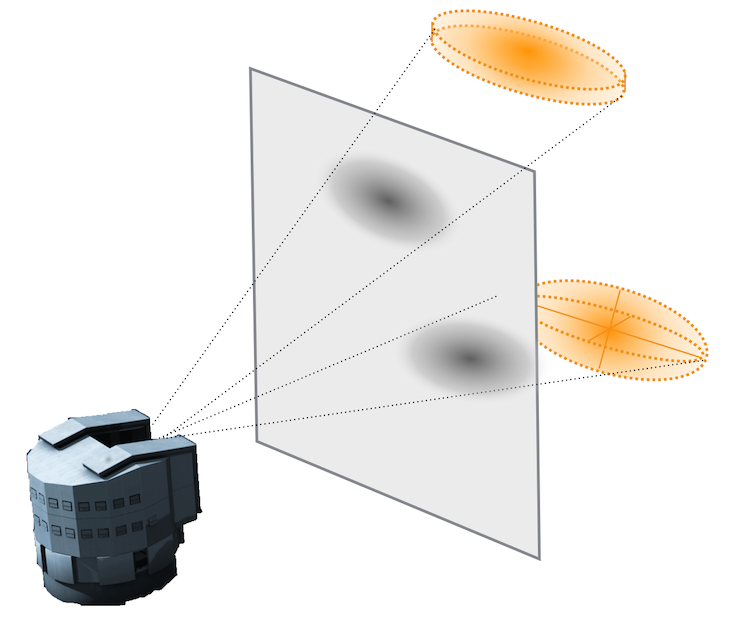 In this way, by measuring the 3D shape of the visible parts of galaxies, we will also learn about the invisible parts. Personalised grafts that safely encourage healing could one day be made from this printable material. The bubble-bursting role of bacteria in sea spray has a profound influence on the global climate.